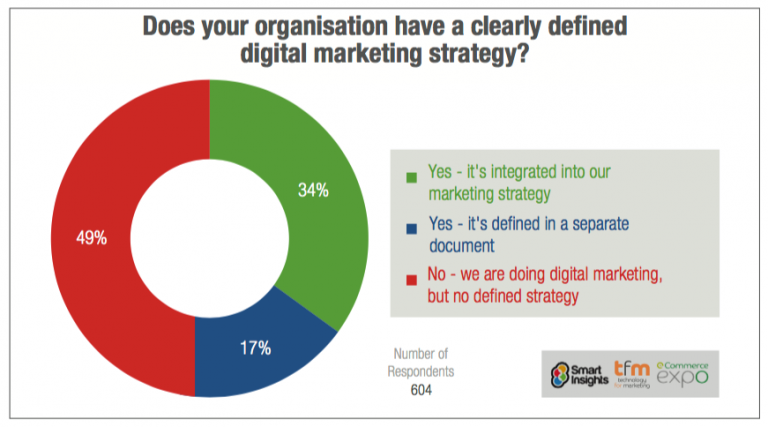 A report by Smart Insights, Managing Digital Marketing , shows that nearly half of marketers have active digital marketing programmes, but no defined strategy at all. The other half is divided between those who have a stand-alone digital strategy (17%), and those who have integrated it into a more general marketing plan (34%). This is the way it should be, for more advanced marketers, for whom digital marketing has become ‘business as usual’. I’m sure that many of the 49% of companies that do not yet have a written strategy are using digital media and getting results, but with an integrated digital marketing plan, digital media like organic and paid search, retargeting ads and social media marketing work better together and can be supported by other activities like marketing automation or conversion optimization of the website. But I am also sure that they would benefit from writing down their approach. 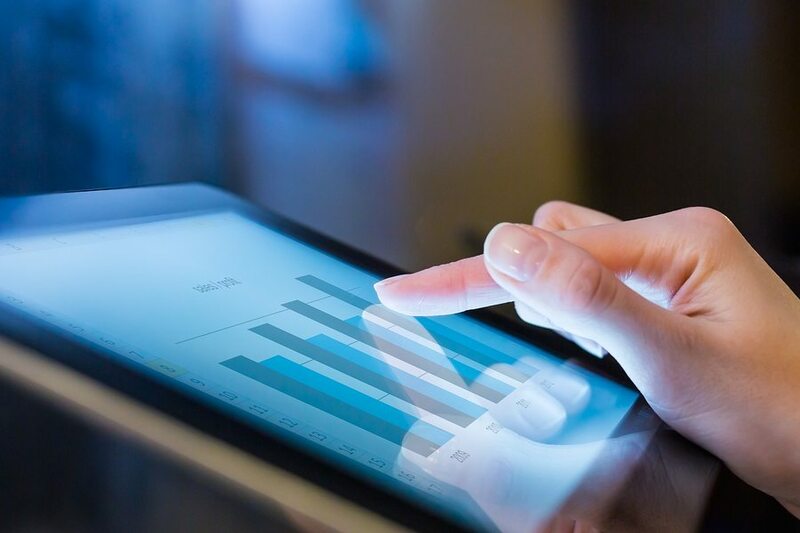 Without specific targets based on creating conversion funnel-based forecasts, it’s harder to know exactly what you need to do online, and later to measure how successful you are. Creating a written strategy forces companies to tackle these crucial questions, as well as formulate a powerful online value proposition, narrowly define the target audience, and carefully consider all the other building blocks for an effective digital program. Another challenge with digital marketing is that there are so many activities you could be working on, that you may spread yourself too thin, or miss key activities. A strategy helps you choose focus on priority strategic initiatives. Through consulting with many businesses, big and small, to create digital marketing strategies, I have identified 25 essential digital marketing activities in our Smart Insights RACE planning framework that are relevant for businesses in different sectors that need to be worked on. An example of the main digital marketing touchpoints that should be reviewed in a business-to-business (B2B) digital marketing strategy are shown in this customer lifecycle map. Without reviewing your options for digital tactics you could be missing out on obvious options to reach and convert prospects. For example, one business-to-business video marketing platform I was consulting with was strong on their top-of-funnel content marketing (ToFu), using Google AdWords to promote their top-of-funnel content assets. But they were weak at deploying middle and bottom-of-funnel content (BoFu) and promoting it through display and email retargeting. Through reviewing priority activities using a lifecycle marketing strategy you can create a planned roadmaps of priorities to focus on. This is much easier to obtain if you have a written plan that spells out what you are aiming to accomplish, how it fits in with the company’s other marketing priorities, and gives you a way of measuring whether it’s working or not. Suddenly you have a digital programme that can be promoted and defended, rather than just “something some of us dabble in”. Sure, you can apply for more funding and hire staff as and when the need arises, but you’ll always be on the back foot. Surely it would be more efficient – and easier to successfully make the case – if you were able to present a long-term plan for budget and staff members? Another case of wastage you also see in larger companies is where different parts of the marketing organisation purchasing different tools or softwre or using different agencies for performing similar online marketing tasks. 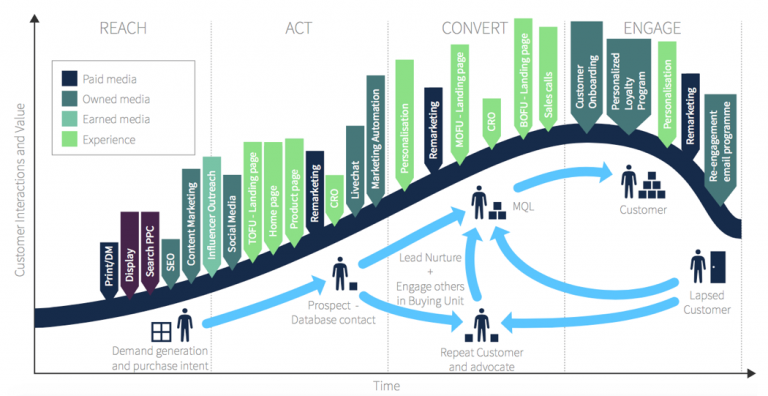 A written strategy, in this case, is about getting better organised so there are a common set of insight and marketing technology to support lifecycle marketing . An integrated strategy will build testing into your programme, ensuring that continuous improvement is possible. A strategy will also help you optimize. A good strategy will benchmark your activity against competitors to show where you are behind the curve and clearly set out what goals you need to hit online, enabling you to measure what’s working and what isn’t, and make the necessary changes. Again, regular reviews will be built into the system, as long as you have a document to refer back to. Writing a strategy does not need to be complicated. Start off with one or two pages describing your goals, tactics and KPIs. A simple table aligning these for each part of the marketing funnel is all you need to get started. This activity alone will make an enormous difference to your online performance, and you can build a more comprehensive document later down the line. To help keep your strategy agile and on track we suggest a 90-day planning approach where the digital strategy isn’t just a report that’s created annually and then potentially ignored. Instead it’s reviewed every 90 days for results from the last quarter and priority initiatives for the next quarter are defined to help keep focus. Guest Author: Dr Dave Chaffey is co-founder and content director of digital marketing strategy advice site Smart Insights.